One of the most confusing areas in family law is the amount of income from Sub S businesses that is available for child support and maintenance. A recent court of appeals decision (which is not recommended for publication but is an authored opinion and therefore can be cited for it’s persuasive value) may actually make this area even murkier. 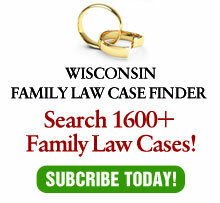 In Biorgo v. Biorgo, 2014AP214 (filed April 30, 2015), the Court of Appeals reversed the decision of the Milwaukee County Circuit Court regarding the application of Sub S income for both child support and maintenance. Sub S income is pass-through income – the business owner is required to report the business income on his or her tax return whether the owner actually received cash in that amount or not. Companies opt for Sub S status for two reasons. First, it avoids double taxation, which can occur if a corporation is taxed on it;s income and the owner is also taxed for dividend income from the business. Second, individual tax rates are lower than corporate rates. Therefore, opting for Sub S staus makes a great deal of sense, unless there is a divorce. The problem may be that judges are generally not CPA’s and their personal compensation is via a W-2, which is far easier to understand. Paying taxes as a flow through from a business is foreign to a W-2 employee. As an example, the court of appeals uses the terminology that “Mark… was required to pay corporation taxes…” This is incorrect. Mark pays individual taxes based on corporate income. The whole idea of a Sub S corporation is that there are no corporation taxes. In Biorgo, the trial court ordered Mark to pay child support based on his prior tears W-2 wages and annual bonuses. The court, however, declined to include Mark’s Subchapter S corporation distributions in his income for purposes of child support. The trial court also awarded Rita maintenance for nine years based on Mark’s W-2 wages and “non-tax, non-business investment distributions” (whatever that means) but declined to base maintenance on Mark’s year end bonuses. The court of appeals reversed the child support order, holding that under the definition of gross income, Mark’s Subchapter S corporation distributions should not be treated differently from other taxable income for child support purposes. Because the court of appeals rejected the cicuit court’s approach to determining Mark’s gross income, it also reversed the maintenance award. The court stated that it could not find any reason why the holding regarding Mark’s income for child support purposes would not similarly affect Mark’s income for purposes of determining maintenance. Thus, on remand, the trial court was ordered to revisit maintenance and property division. It might be simpler if Wisconsin, like some other states, used net income for child support calculations. But we use gross income instead. Therefore, we commonly require a support payer to not only pay the requisite support amount, but also to pay the taxes on the amount necessary to generate the support. Since the child support formula incorporates the taxes paid on the income, it is consistent to apply all Sub S income for child support. And, since maintenance is fully deductible, a court can also use Sub S income for this purpose within the range of fair results. The problem is that Sub S income doesn’t always work the same as W-2 income. A company can (and some do) distribute just enough cash to pay the taxes with no cash left over to pay support. The result can be support that will have to be paid from phantom income. On the other hand, a support obliger should not be allowed the choice whether to distribute income in an effort to avoid support obligation. The issue is easier for a trial court if the payer owns more than 50% of the Sub S company and thus controls the distribution. But while IRS regulations require that an owner is taxed on Sub S income in the same percentage as ownership, the actual cash distributed may not be sufficient in every case to actually make a support payment. In additon, the timing of the distributions may not sync with the tax year in which the income must be declared. The result can be quite unfair to one party or another. The bottom line is that trial courts need to have the discretion to do what is fair in each individual case. Yes, this might mean that a trial court may have to hear witnesses and make a decision, but that is the reason for their existence. In Biorgo, the appellate court goes to great lengths not to tie a court’s hands. The court seems to be troubled by the record created below, so when it reversed the trial court, it remanded without specific instructions other than to reconsider. As a result, this may be the perfect case to be authored (and thus, cited for its persuasive value) but not published and precedential. It gives some direction to trial courts without handcuffing them. That may be the perfect middle road for a difficult issue.